And according to cultural theorist Stuart Hall, the media obtain their information from the primary definers of social reality in authoritative positions and amplify the perceived threat to the existing social order. The authorities then act to eliminate the threat.3 The dominant ideas or ideologies are reproduced by relying on the opinions of the defining authority and then spread through the media. The communal good has been assailed. 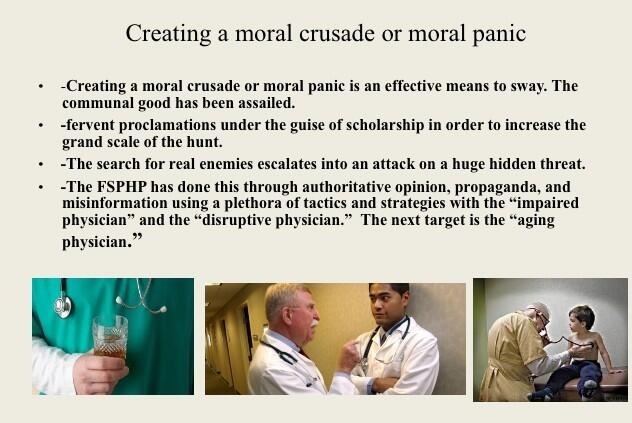 As a society governed by organizations, associations, institutions and regulatory bodies, the medical profession is not immune to “moral panics.” A threat to patient care or the values of the profession can be identified and amplified. A buildup of public concern fueled by media attention ensues creating a need for governing bodies to act. Medical Professionalism and the Public Health has been assailed. Unbeknownst to the general public and most members of the medical profession at large, certain groups have gained tremendous sway within medical society. Through moral entrepreneurship they have gained authority and become the primary definers of the governance of the medical profession and the social control of doctors. To benefit their own interests they have fostered and fueled “moral panics” and “moral crusades. ” Exhorting authorities to fight these threats by any means necessary they have successfully made and enforced rules and regulations and introduced new definitions and tools with no meaningful resistance or opposition. The Inquisition did not have to convince individual citizens or the general public of their beliefs to advance an agenda; just Ecclesiastical and Political Authority. Similarly, the “impaired physicians movement” did not have to convince individual doctors or the medical profession of their beliefs to further a self-serving agenda; just regulatory and administrative authority. The “impaired physicians movement” can be defined as a group of physicians with alcohol and substance abuse problems who, having found sobriety through 12-step spirituality, banded together to promote the ideology behind their personal “recovery” to other doctors and the medical community at large. In the 1980s the movement gained momentum and as their numbers grew began calling themselves specialists in “addiction medicine.” The American Society of Addiction Medicine (ASAM) is not a true specialty, but a Self-Designated-Practice-Specialty, which simply means that is what they are calling themselves. It reflects neither knowledge nor expertise.. “Board certification” by the American Board of Addiction Medicine (ABAM) is not recognized by the American Board of Medical Specialties (ABMS). ABAM certification requires only a medical degree, a valid license to practice medicine, and completion of residency training in ANY specialty. Addiction Psychiatry, a subspecialty of psychiatry under the American Board of Neurology and Psychiatry is the only specialty recognized by the ABMS. and their specialty society is the American Academy of Addiction Psychiatry. The ASAM is schooled in just one one uncompromising model of addiction with the majority attributing their very own sobriety to that model–the chronic relapsing “brain disease” with lifelong abstinence and 12-step spiritual recovery model. As the “voice of addiction medicine,” the ASAM has nevertheless defined the dominant treatment paradigm in the United States. ASAM doctors outnumber addiction psychiatrists by 4:1 and the movement is well funded. Because addiction is defined as a “disease”, addicts must be “treated” (more often coercive than voluntary), and “cured” (defined as abstinent). The billion dollar assessment and treatment industry and the drug and alcohol testing industry lucratively profits from this model which has grown to monopolize addiction treatment in the United States. The goal of the ABAM Foundation is to “gain recognition of Addiction Medicine as a medical specialty by the American Board of Medical Specialties (ABMS).” A monopoly defined by self-appointed experts without recognized specialty training will soon likely Robber baron their way to being accepted as a true specialty. Physician Health Programs (PHPs) meet with, assess, and monitor doctors who have been referred to them for substance use or other mental or behavioral health problems. Unless being monitored by one, PHP practices are unknown to most physicians and operate outside the scrutiny of the medical community. Initially funded by State Medical Societies and staffed by volunteer physicians, PHPs served the dual function of helping sick doctors and protecting the public. As the populations of ASAM physicians proliferated in the 1980s, many joined their state Physician Health Programs. PHP doctors who did not agree with the ASAM groupthink were gradually removed and they organized under the Federation of State Physician Health Programs (FSPHP). 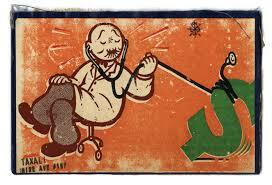 Other ASAM physicians found employment at treatment centers as staff physicians and medical directors. The FSPHP cultivated a relationship with the Federation of State Medical Boards (FSMB) and the state PHPs formed alliances with their state medical boards. Promoting themselves as offering “treatment” rather than”punishment” they offered an alternative to disciplinary action. They then began promoting their successful outcomes in rehabilitating “impaired physicians”, and this history can be seen by examining the archives of the Journal of Medical Regulation and similar publications. In 1995 the Washington PHP claimed a success rate of 95.4%, Tennessee claimed 93% and Alabama 90%. Part of this success was attributed to the specialized treatment centers for doctors directed by their ASAM colleagues such as Ridgeview Institute in Atlanta created by G. Douglas Talbott. Talbott, who helped organize and serve as past president of the ASAM claimed a 92.3 percent recovery rate. He also put forth a Medical Urban Legend–the proposition that doctors were a different species, separate from the rest of society, who needed special treatment three times longer than anyone else. Amazingly, this dicto simpliciter argument that can, in fact, be refuted simply by pointing it out was allowed to enter regulatory medicine unopposed. Simply because, sadly, no one ever pointed out the logical fallacy. It is now entrenched. Three months or more of treatment is standard of care for our profession. They did this by getting medical boards and the FSMB to accept fantasy as fact by relying on board members tendency to accept expert evidence at face value. Physicians are unique only insofar as the unique elements required of the profession to become and be a physician such as going to medical school and completing the required board examinations. That’s it. I implore anyone to put forth any sound argument based on science and evidence that justifies a thrice lengthy stay in medical professionals. Not gonna happen. Thought stopping memes and logical fallacy is the best they have to offer. And, unfortunately this type of rabbling gibberish cuts the mustard in the regulatory medicine venue. A “low-bar” evidentiary standard is not the problem. If you look at the documentary evidence from a medico-historical perspective there never was a bar. The FSMB has essentially given the impaired physicians movement carte blanche authority and unrestrained managerial prerogative. A bar never even existed. It’s a laissez-faire Lord of the Flies free-for-all. The logical fallacy of appeal to authority–illegitimate and irrational authority. Bamboozled by smoke and mirrors. A 1995 issue of the FSMB publication The Federal Bulletin: The Journal of Medical Licensure and Discipline contains reports on eight separate state PHPs. The “almost 90% success rate” was applauded by the editor, who added “cooperation and communication between the medical boards and the physician health programs must occur in an effort to protect the public while assisting impaired physicians in their recovery.” And more recent reports suggest PHPs reduce malpractice claims. They are now being promoted as a replicable model to be used in other populations. The problem is no one bothered to examine the methodology to discern the validity of these claims. There has been no critical analysis or Cochrane type review of any of these studies which are invariably small, methodologically flawed, and biased. To paraphrase one FSPHP member, “Who needs evidence-based medicine when the boards have already accepted these tests as valid?” Who indeed? The ideological bias and financial conflicts of interest between PHPs and the treatment centers was also not recognized. It still isn’t. The spotlights are apparently all on Big Pharma in this regard. Some sunlight needs to be exposed in the direction of the billion dollar drug and alcohol testing and assessment industry as well. Doctors were held at Ridgeview three times longer than the rest of the population (and at three times the cost) under threat of loss of licensure. Although there is no evidence base or plausible explanation why an entire profession would have a three-times longer length of stay than the rest of the population this continues to be the reality. There is no choice. in 2011 The ASAM issued a Public Policy Statement on coordination between PHPs, regulatory agencies, and treatment providers recommending that only “PHP approved” treatment centers be used in the assessment and treatment of doctors. It specifically excludes non “PHP -recognized” facilities. And what defines a “PHP approved” treatment center? In addition to finding essentially no oversight by the state medical society and medical board, a recent audit of the North Carolina PHP found financial conflicts of interest and no documented criteria for selecting the out of state treatment centers they used. The common denominator the audit missed was that the 19 “PHP-approved” centers were all ASAM facilities just like Ridgeview whose medical directors can be seen on this list. 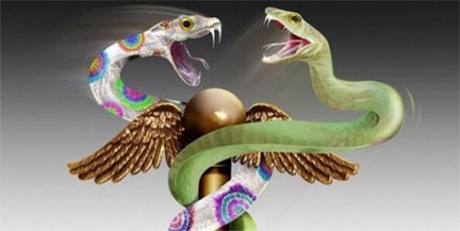 The appeal to authority logical fallacy has enabled the FSPHP to become the expert authority on physician impairment through the eyes of the medical boards. It has also allowed them to increase their scope. Inherent in this model is the importance of external control. It gives them power to exert control over the individual regardless of whether they need to be treated. By introducing and fueling moral panics the ASAM/FSPHP political apparatus has been able to expand in both scope and power. “They’re often described as the best workers in the hospital,” he says. “They’ll overwork to compensate for other ways in which they may be falling short, and to protect their supply. They’ll sign up for extra call and show up for rounds they don’t have to do.” Physicians are intelligent and skilled at hiding their addictions, he says. Few, no matter how desperate, seek help of their own accord.” In reality this is absurd. And if you look at any of the current “moral panics” that are being used to suggest random suspicion-less drug testing of all doctors or promoting the Physician Health Programs as the “New Paradigm” you will inevitably find a doctor, just like Marv Seppala who is on this list as an author or interviewee. It is a given. Across the Country doctors are going to the media, law enforcement, the AGO, and the ACLU only to be turned a deaf ear. Many consider this a “parochial” issue best handled by the medical community. Doctors reporting crimes are turned back over to the very perpetrators of the crimes. The Medical Societies and professional organizations contribute to the problem by willful ignorance. Accusations are used to disregard the claims of the accused. It is a system of institutional injustice that is driving many doctors to suicide. Hopeless, helpless, and feeling entrapped many are taking this route. And no one is talking about it. This cannot be avoided any longer. Cohen S. Folk Devils and Moral Panics: The Creatio of the Mods and Rockers (New Edition). Oxford, U.K.: Martin Robertson; 1980. 2. “Stories from whistleblowers suggests that a repeated and highly consistent aspect of the whistleblowing experience is the abuse by the employer of medical and psychiatric appointments as a mechanism for intimidating whistleblowers and avoiding the need to address the real issues.